A capsule range of skincare by Origins which brightens hydrates and is infused with antioxidant-rich White Tea to help ward off free radical damage. Believed to extend longevity, White Tea was prized for centuries by emperors in China's famed “Elixir of Immortality”. The legend has more than a leaf of truth to it. White Tea is packed with polyphenols, a potent antioxidant that helps protect skin from damaging free radicals. Discover skin utopia with Origins A Perfect World™ Age-Defense Skin Guardian with White Tea; an anti-ageing treatment that works to deliver longer-lasting youth, health and vitality. Enriched with powerful Silver Tip White Tea which creates a virtually impenetrable bubble of protection on the skin, its age-fighting formula immediately smoothens the skin whilst exotic Mimosa, Orange and Bergamot envelop your senses to create a feeling of paradise. 'Skin has found its Shangri-la' with this complexion loving formula. 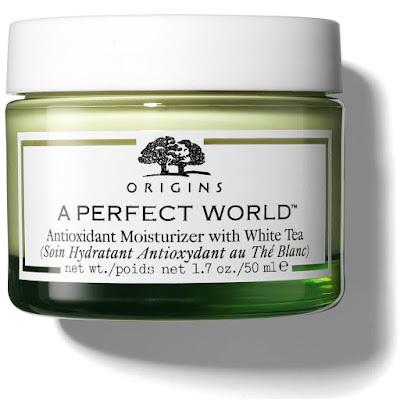 Combat ageing and pollutants with the Origins ‘A Perfect World™’ Antioxidant Moisturiser with White Tea. Forming a virtually impenetrable protective barrier on skin, the anti-ageing face cream harnesses the powers of Silver Tip White Tea – renowned for its potent detoxifying properties – to effectively shield against pollutants and free radicals that can cause premature signs of ageing. Enriched with an aromatic blend of Orange, Bergamot and Spearmint, the moisturiser is ideal for normal and dry skin types, working to leave your complexion feeling refreshed and supple while helping to maintain a youthful-looking glow. 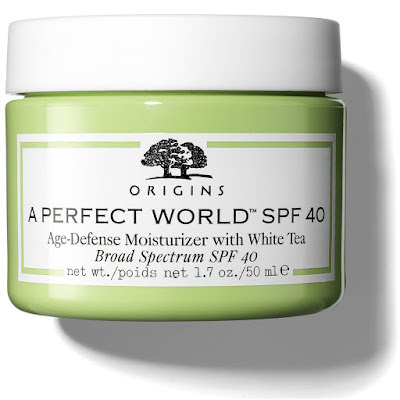 Protect and nourish skin with the ‘A Perfect World™’ SPF40 Age-Defense Moisturiser with White Tea from Origins. 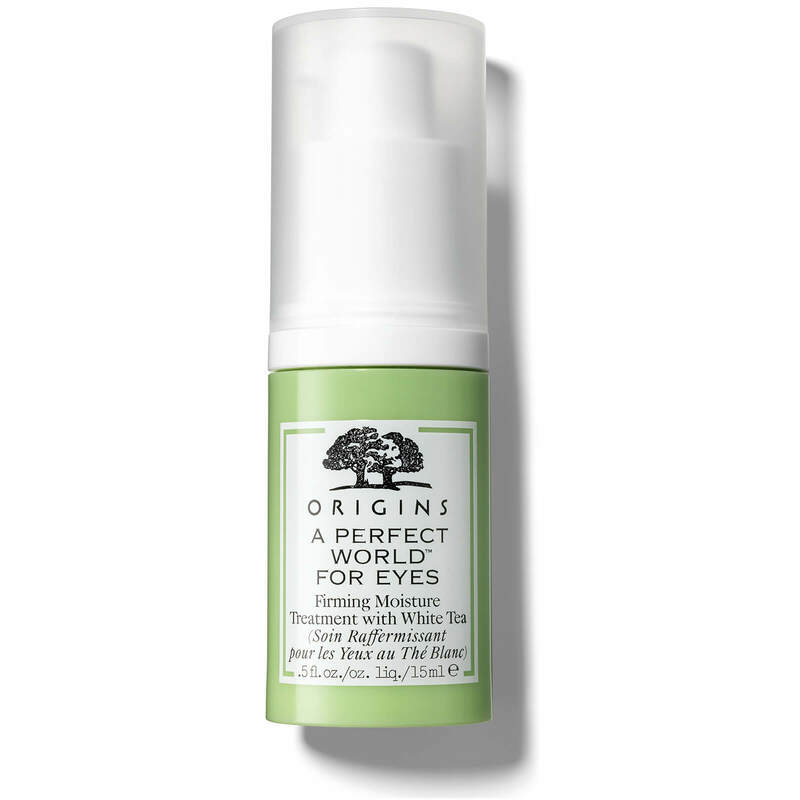 Specifically designed to combat daily pollutants and environmental damage that lead to premature signs of ageing, the lightweight formula rapidly absorbs into skin to form a protective barrier that helps delay the appearance of wrinkles and fine lines, with Silver Tip White Tea actively working to fight free radicals. 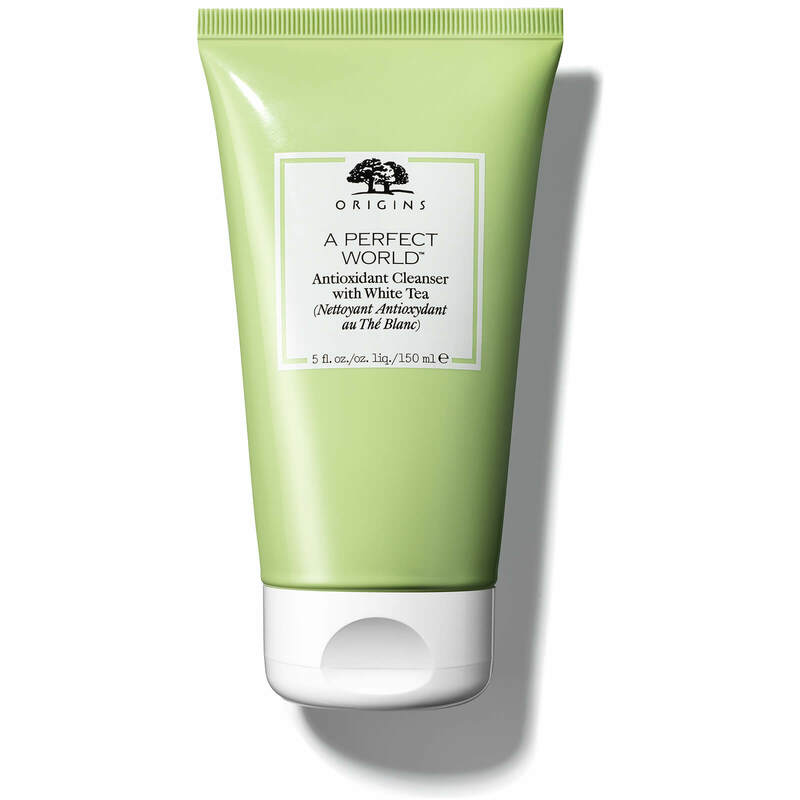 Ideal for dry and combination skin types, the oil-free face cream provides broad spectrum UVA and UVB protection and leaves you with skin that feels hydrated, revitalised and replenished. Protect delicate skin with the Origins A Perfect World™ for Eyes Moisture Treatment with White Tea. Ultra-lightweight and hydrating, the soothing eye cream has been specifically developed to tone, brighten and strengthen skin, forming a shield against free radical damage, environmental aggressors and visible signs of ageing. Antioxidant-rich Silver Tip White Tea actively works to block oxidation, while White Birch extract smoothes the appearance of creases and wrinkles. Suitable for all skin types, the eye contour feels replenished and refined with improved resistance to the elements. 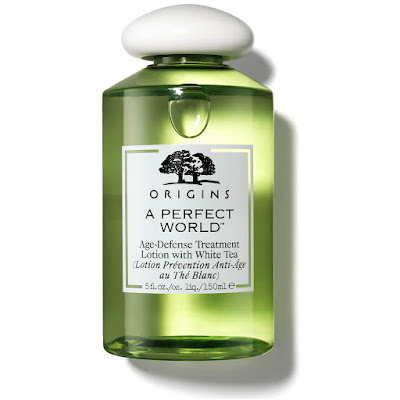 Nourish and soothe dry, ageing skin with the Origins ‘A Perfect World™’ Antioxidant Treatment Lotion with White Tea. Free from oil or alcohol, the gentle formula veils skin with a protective barrier against pollutants, free radicals and environmental aggressors. Essence of Silver Tip White Tea - known as the elixir of immortality - infuses skin with antioxidants and essential nutrients, with Trehalose helping to replenish moisture levels. Skin feels smooth, comfortable and ideally prepped for further skincare treatments. 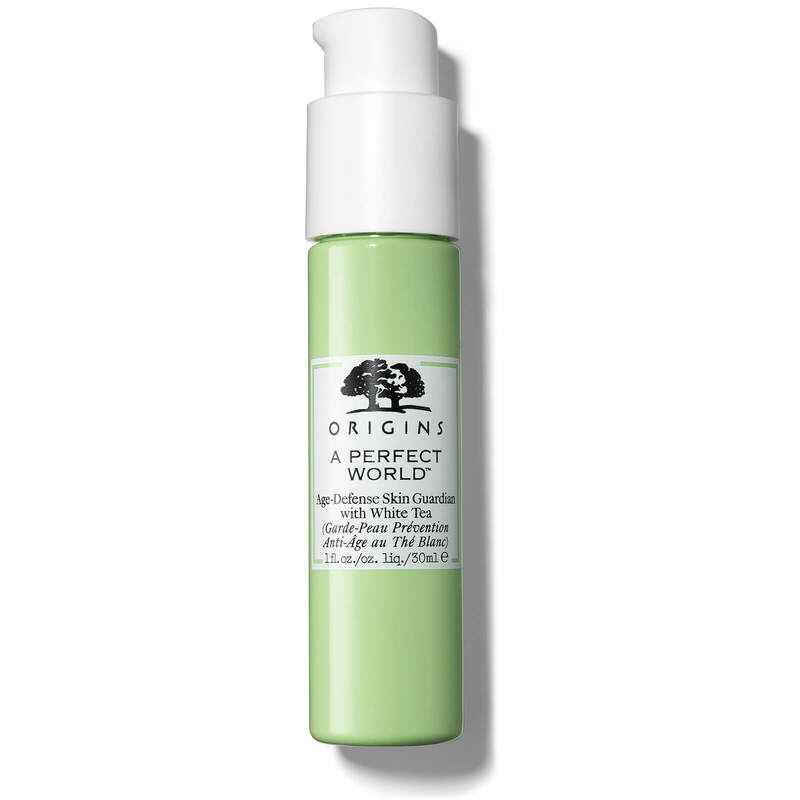 Deeply purify skin with the Origins A Perfect World™ Antioxidant Cleanser with White Tea; ideal for dry, normal and oily skin types. Expertly developed to tackle the negative effects pollution has on skin, the foaming face wash delves deep into pores with dirt-extracting minerals to unclog and decongest. 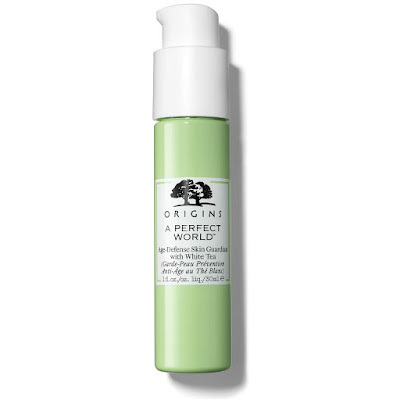 Enriched with Coconut and Silver Tip White Tea extract, the soothing formula is brimming with antioxidants to effectively combat free radical damage and damaging impurities, helping to prevent dehydration and cellular decay that causes wrinkles. As a result, skin feels soft and refreshed with a more even and balanced tone.